The Pros and Cons of the Most Popular Scottsdale Garage Floor Coatings! Here are the pros and cons of the most popular garage floor coatings! When you walked into your garage this morning, did you look at the floor and think “Wow! This looks awesome!”? If you are like most people, you probably didn’t. Garage floors in Scottsdale are often neglected, beat up and “blah” looking. It is one of those projects, we plan on getting to eventually. But giving your garage concrete floors a much needed makeover is not only beneficial to its looks but will increase its durability many times over. Check any home improvement website or magazine and you will see that your Scottsdale garage floors do not have to look grey and sad anymore. Many floor coatings are able to pep up the look and step up your floor’s performance as well. To shed some light on the different options available to you, we have compiled a short list. This is your go to solution if you are on a budget as it is the cheapest coating you can put on your Scottsdale garage concrete floors. Just like your wall paint it comes in oil based (use a primer with this one) or latex based versions. Another positive factor is that it is easy to apply. Paint your floor just like your walls and you are done. No experience or special equipment needed, but keep in mind that it is vulnerable to chemicals and needs to be touched up every other year or so to make sure it still looks and protects as well as it should. Epoxy garage floor coatings are without the doubt the powerhouse of Scottsdale garage floor coatings. They are stain resistant, chemical resistant and easy to clean. That means you don’t have to worry about dropping a chemical on your garage floor nor will you spend hours on your knees scrubbing away old stains. In addition, epoxy flooring 85266 finishes are harder than the concrete they cover, which means that if you end up dropping a hammer or tire iron, chances are, your floor will live through it without a scratch. If you are worried about the look of your garage floor, with epoxy floor coatings 85259, you have hit the jackpot. There are so many colors, chip blends, metallics and versions available, you will be sure to find a floor coating to match your taste and needs. Epoxy floor coatings 85260 are highly recommended if you have a high traffic garage. It doesn’t get more durable than that. And it looks awesome! While it has many pros it does have a few cons as well. For one, if you are starting with an already beat up floor, you will have to spend money on cleaning and restoring it, before the epoxy concrete coating can be applied. Also, it is best to let an experienced concrete floor coating specialist handle the application, as epoxy can be a bit tricky to handle. It dries really fast, so you have to work really fast. While it is also not ideal if you are dealing with moisture issues, here in the valley that is rarely an issue. Concrete stains are another great floor coating option for your Scottsdale concrete garage floor. There are many great stains available. To ensure you are doing the best for your family and the environment, make sure your local garage flooring contractor works with stains that are low VOC. This does not mean that your garage floor won’t last. Many stains have great UV resistance and will withstand the hot Arizona sun and look vibrant year after year. Like the epoxy coatings, they are truly easy to clean and come in a myriad of color options. A sealer makes sure that your stain will remain beautiful and easy to clean. Concrete floor sealers are tough and durable. You can try this one on your own as well and apply it with a roller (or brush). They are available as solvent or water based and are reasonably durable for their price point. Most are clear, but if you are looking to add a bit of color to your garage floors, you can purchase a tinted version as well. If you are looking for a more modern, sleek and slightly industrial look for your garage floor, consider having your Scottsdale concrete floor specialist perform a grind and seal. By grinding the floor before sealing it, you will achieve a smooth surface that looks awesome and is fairly durable as well. To punch the durability up a notch, have your floor technician apply a coat on top of it. Even better, consider adding a stain to your floor for a uniquely modern grind look. While you do not have to seal your concrete garage floor, an unsealed floor will show water stains and other spills much faster and more prominently than one that is protected through the application of a sealer or stain. If you are debating between polished and grind and seal concrete flooring, here are some more things to keep in mind: a polished floor is much more vulnerable than you might think, and costs more than one that was ground and sealed. Grind and sealed floors are low maintenance, non-porous, and abrasion resistant. In the end, what kind of garage floor coating you choose will depend on your budget, your taste and the unique needs of your garage floor. 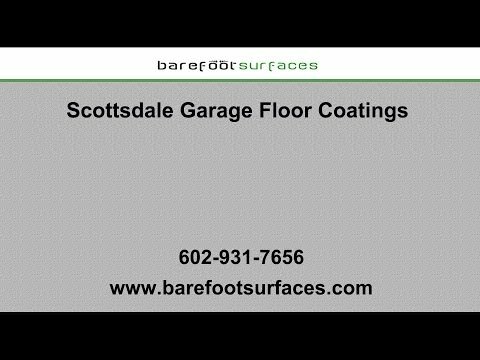 The garage floor experts at Barefoot Surfaces have years of experience in garage floor coatings, Scottsdale garage cabinets, and even our top-rated patio epoxy flooring contractors in Scottsdale. Contact us today, for a free estimate or more information about our services.